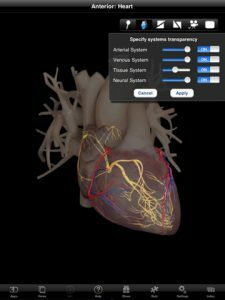 Developed by 3D4Medical.com LLC, Heart Pro for iPad is a truly amazing resource for doctors, medical students and health professionals alike. Heart Pro takes the 3D4Medical.com range of educational anatomy applications to a whole new level, with the introduction of a fully-3D heart model that you can rotate and view from every angle. With naturally intuitive controls, Heart Pro allows the user to manipulate the heart in space using a series of finger drags and swipes. The heart can be sectioned into Coronal, Sagittal and Transverse views by making a long swipe in the desired plane or by tapping on the relevant section in the navigation bar. 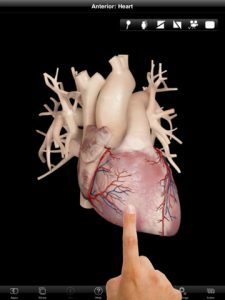 In addition to the various anatomical views and slices, there are also 10 animations that demonstrate different aspects of cardiac physiology including the conduction of a heart beat and blood flow in a beating heart. Pins can be enabled at any time, and in any view by tapping the screen once. The pins label important cardiac structures and vessels, the names of which can be revealed by tapping on a pinned structure. To access additional information, you just tap on the “i” icon. 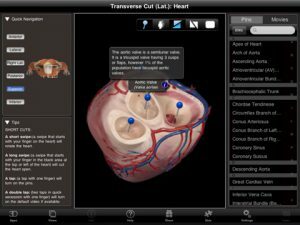 Holding the iPad in landscape orientation reveals further features, including a quick navigation panel with an anatomical model of a human that shows the “view” that you are looking at the heart from (i.e anterior, lateral, posterior, superior, inferior). The quiz can also be accessed in landscape mode, which selects random structures, including soft tissues, vessels and conduction pathways and asks you to identify them from a list of multiple-choice options in under 10 seconds. You can also choose particular areas of the heart to be tested upon, rather than the whole organ. It’s an excellent way to test yourself, and allows you to revise the areas of your anatomy that need the most work. 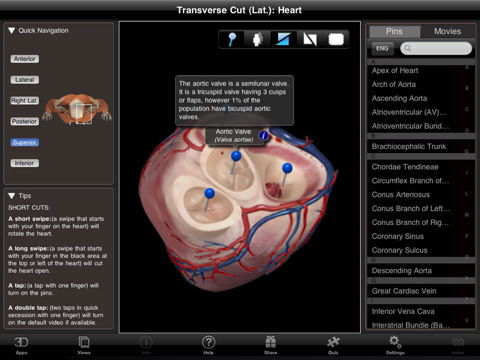 Bottom Line: Heart Pro is an impressive educational application – both highly-detailed and anatomically accurate. A valuable reference especially suited to medical students and clinicians. 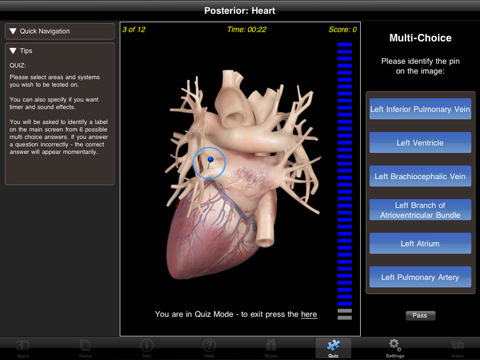 Heart Pro [iTunes Link] is compatible with iPad. Requires iPhone OS 3.2 or later.